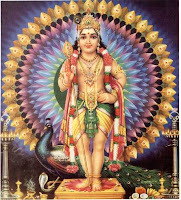 'vilayAda idhu nerama' is a tamil composition of T.N.baala dedicated to Lord Muruga (Karthikeya) set on raagam shanmugapriya and talam Adi. Bala Mama, as he is affectionately known, is a great singer and composer. T.N.Bala who lives in Pennysylvania , U.S.A is a student of Mani Iyer. This song Vilayada idu nerama composed by him was popularised by late maestro Maharajapuram Santhanam. Hi vijayasri, How are u? I like your blog. It is very nice and helpful. Especially u are posting lyrics is very useful for music lovers. If you could post lyrics of Nithyasree Mahadevan Janani Janani Janani kadalur subrahmanya song.